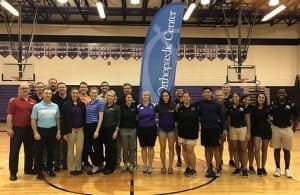 For more than five years, the Orlando Orthopaedic Center Foundation has partnered with UCF athletic training students to provide annual sports physicals for local area high schools, club teams, and Seminole State College. The Foundation offers the pre-participation examinations to student-athletes throughout Central Florida and donates 100% of the fees to each high school’s athletic program. The sports physicals also give athletic training students an opportunity to work with “real world” patients and administer vision tests, height and weight measurements, blood pressure and pulse assessments, and musculoskeletal screenings. UCF students also have benefited from scholarships provided by the Foundation to further their studies, and continuing education opportunities are provided to athletic trainers twice a year.